I have decided that my cat Skipper is a bad influence on other cats. Recently, while my husband and I were enjoying some downtown adventures in Chicago, Skipper decided he needed to have some misadventures of his own. And lately, those misadventures seem to involve encouraging other cats to go along with his "bad" behaviors. After my husband and I returned from Chicago, we opened the front door of our house in Austin, where Skipper and our 16 year old cat Cisco were being cared for, to discover that the door to the outside had been torn off. Well, not "the" door, but the cat door. And on one side of the hole in the door where the cat flap used to be, was the plastic flap that had somehow been taken off of the door. The scene of the crime - did my cats suddenly grow thumbs to get that flap off? 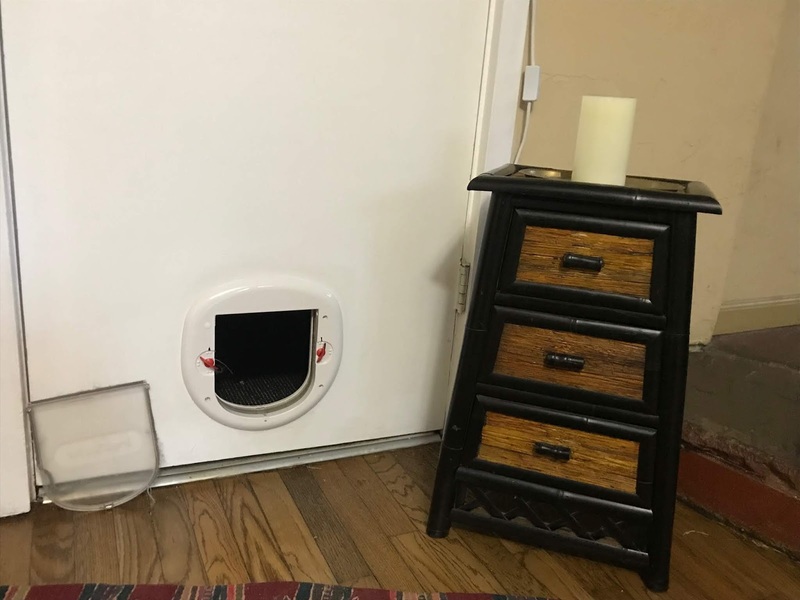 On the other side of the door was the cabinet that I had asked the sitter to put in front of the cat door - just as added insurance that certain cats would not find a way to unlock the cat door. The friend helping with the cats was asked to lock them in at night, and someone else unlocked the door in the mornings to let them out. The only reason all of this was necessary was because of Skipper. Our house in Austin is near the greenbelt, and coyotes have been known to come into our neighborhood. 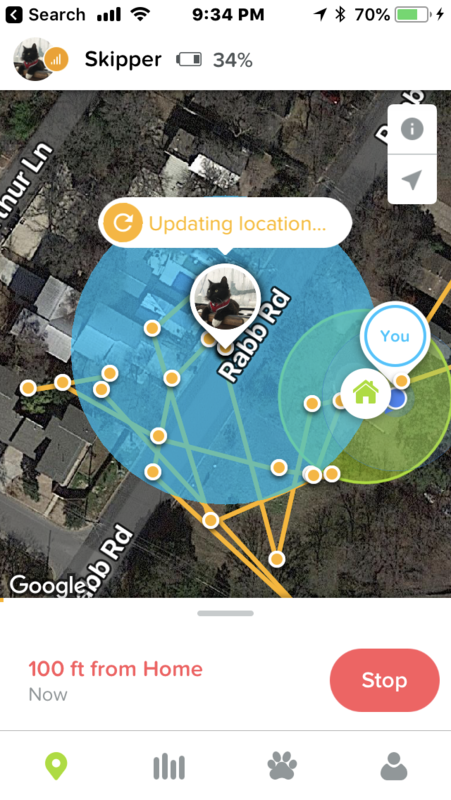 And while Cisco never goes beyond the front or back door, Skipper is a traveler, and we know from his gps tracker that he ventures out very far from the house. Hence, his night time restrictions. A typical route Skipper travels - indicated by the zigzagging lines. But Skipper doesn't really do well with restrictions. I consider it a parental failure on my part, of course, that he apparently is convinced that he should be able to do whatever he darn well pleases. Had I just been a bit more of a disciplinarian, surely he would not be breaking down doors? And as long as I am taking the blame here, it was also my fault that I wasn't clearer with the friend locking them in. 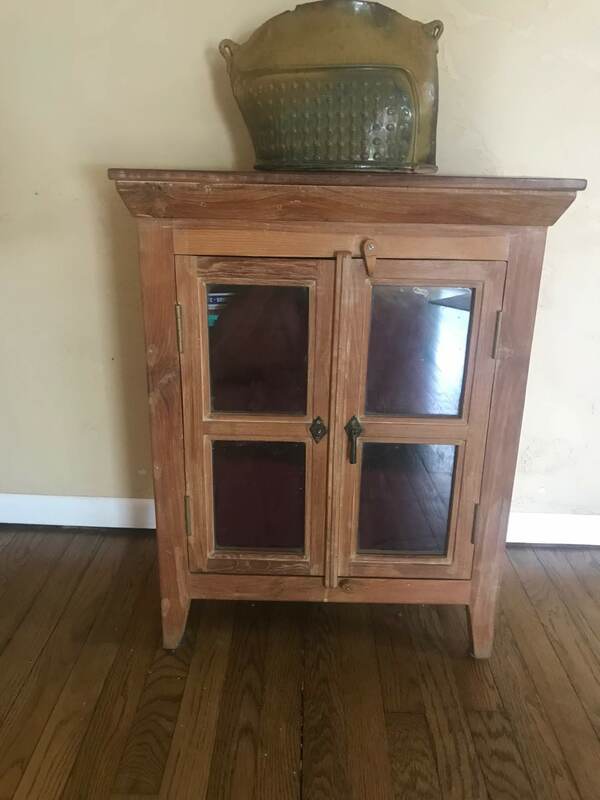 She assumed I meant the smaller cabinet to the right of the door, which is the one shown in the above picture next to the broken door. Had I been more specific, she would have known that I meant the heavier one to the left of the door. I knew from experience that Skipper could push anything smaller out of his way - since he had done it in the past. The cabinet that is so heavy, it has to be scooted. Fortunately, even though they had managed to break out when they were supposed to be inside, both cats were ok, although Skipper didn't come in until after dark. 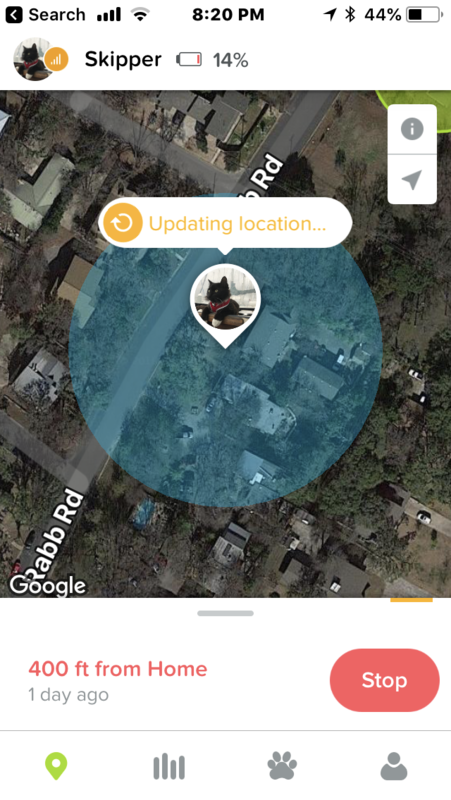 Usually I can at least keep track of where he is, because he wears a GPS tracker (further proof of his misbehaving ways!). But as luck would have it, his tracker had somehow disconnected from the server and so it wasn't providing his location. How did he manage to pull that off, I wonder? Usually when he gets out he will go for 3 or 4 miles. Now those are not straight miles. Typically the most distance he goes from the house is 400 feet, but he does a lot of zigzagging. This is what I saw on his tracker the entire time I was in Chicago. How did he manage to disconnect his GPS? 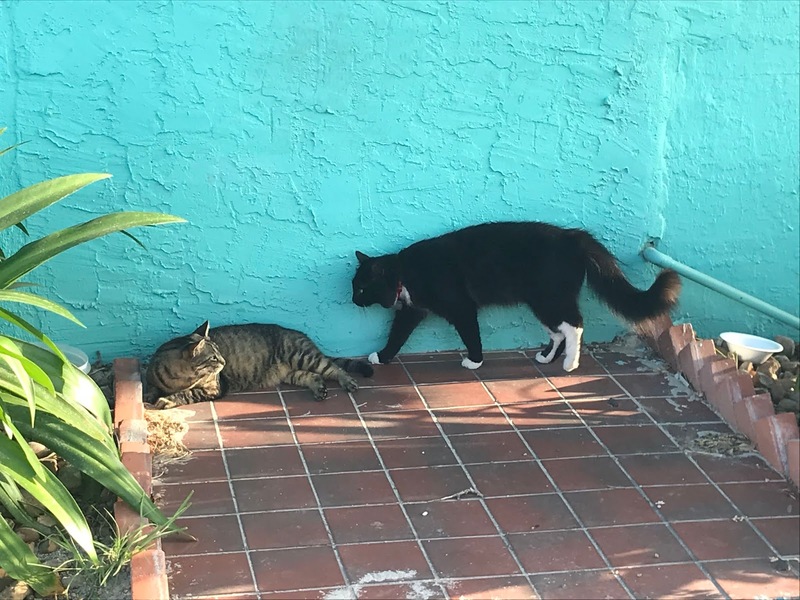 However, based on this and other examples, it does look as if Skipper is becoming the neighborhood "bad kid" who teaches the other cats around him to try out new and sometimes risky behaviors - like escaping a house when you should stay safely inside. Our elderly cat Cisco is typically a very well behaved cat, but based on how far the cabinet was moved, I have to believe that Cisco was somehow involved in the escape. Poor innocent Cisco who was brought into Skipper's life of crime, when all he wanted was an extra treat. Skipper: OK Cisco, here's the plan. I'm going to slip my claws under this plastic thing blocking our exit until I am able to pry it off and get us out of here. Your job is to use your massive body to then push that wooden object far enough out of the way for us to get back in. Our humans will never even realize we had left. Cisco: I don't know about this idea Skipper, but as long as you promise to be nice to me and give me your portion of treats when our human offers them, I'll do it. I am not blaming Skipper for being a bad influence based on this one incident, however. 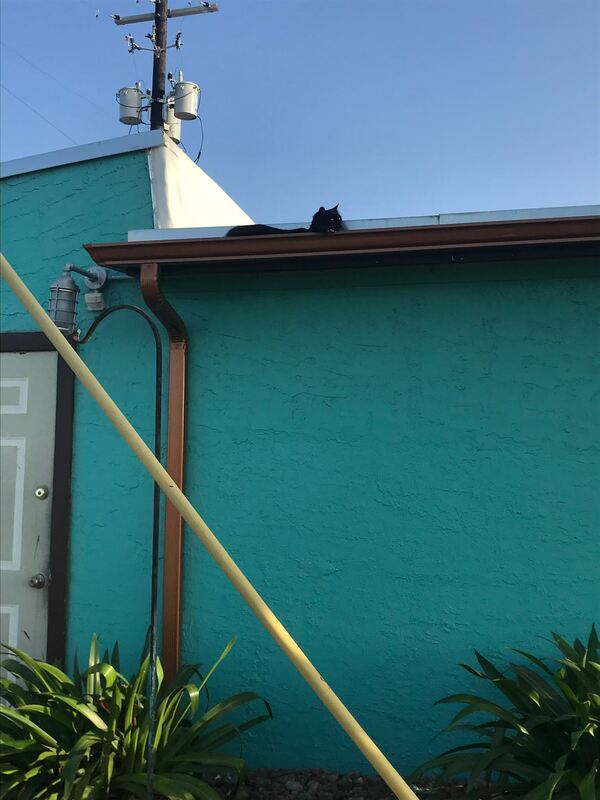 When we are in Rockport I have also seen Skipper's influence on the feral cat Gracie who hangs around the Daily Grind Coffee Shop. 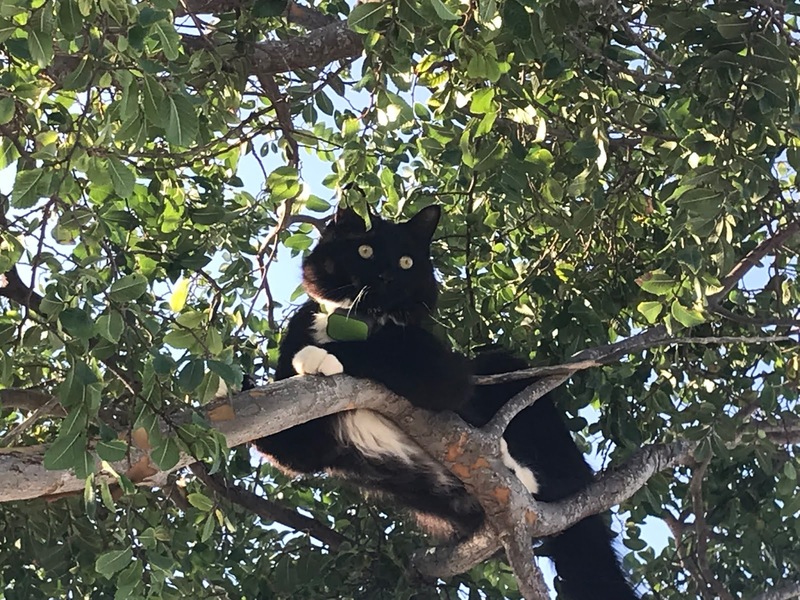 Skipper loves to jump from the tree up to the roof of the Daily Grind. 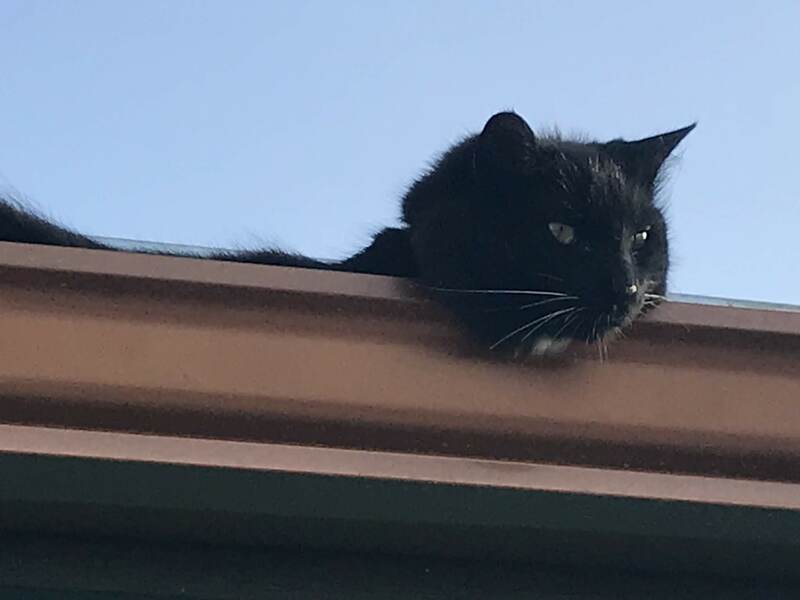 Recently when he was up there he realized he hadn't had a nap in an hour or so, and proceeded to go to sleep in the rain gutter. Before this, I had never even seen Gracie climb the tree, much less hang out in the gutter - that is until Skipper did it. 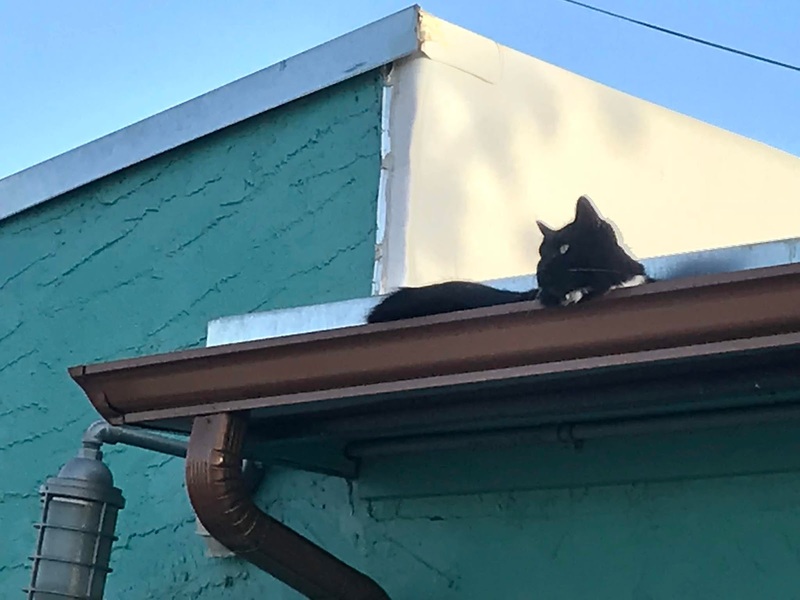 A few days after I had to coax Skipper down, I looked up to see Gracie sleeping in the gutter. Nice napping location - but then, anywhere is a nice napping location. Skipper thinking that he is hidden from view. Oh, were you talking to me? Skipper and his Rockport trainee - Gracie. I am thinking that maybe it's time to bring in the Cat Whisperer to work with Skipper. Or maybe it's time I became a stricter disciplinarian. Sadly, there is a good chance neither of those things are going to happen. So maybe the best I can hope for is that Skipper will soon outgrow his misbehaving kitten ways and become a responsible adult cat. It could happen - my adult human kids are proof of that.